So a North London Derby win and a true marquee signing has wrapped up the first two weeks of the Premier League season, and it also marks the end of the first 'chapter' of the Gooner On The Road challenge in Europe, with the next stop being Montreal in Canada to kick off the North American section of this ridiculous challenge I've talked myself into doing. I spent much of my time in Gothenburg nursing a hangover (I sound like a broken record) after celebrating the beating of Spurs. Thankfully my host Jesper Larsson, who also helps to run Arsenal Gothenburg, was more than happy to do what he could to get me feeling human again. To me, I felt that Gothenburg was a bit like Copenhagen in that, although it seems like a fantastic city to experience some great culture, if you're a backpacker and you're watching the pennies, you're limited to what you can really do. Having come from Prague and Berlin before these two Scandinavian cities, the difference was measured mainly in the price of the beer, but I'm sure you can apply the same thing to other areas that don't cause immediate brain-failure afterwards. At least this time I didn't succumb to the tourist trap open sandwich at £15 a pop. 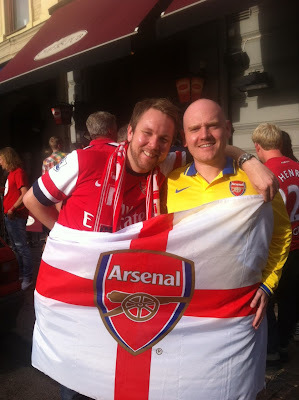 In fact, even if I had wanted to spend any money in Gothenburg, I don't think the local gooners would have allowed me to. It was like this at the Cheers Pub for game day, but it was also the case with Jesper, the GOTR host in Sweden, who paid for virtually everything whilst I was there and didn't want to see the colour of my money, which really was top notch. Of course, Jesper also helped to put together a great lottery that helped raise near-enough-makes-no-difference £600 (with a little help from the pub of course!) for TNBC. It was the pre-season tour, we played against Swedish team, Trollhatter 1991, I think I was 10 years old. My Grandad always supported Arsenal, so he took me to this game at Trollhatter (Limpar was playing). I got a scarf and my first questionable replica Arsenal jersey. Dennis Bergkamp. I'd rather see clips on Youtube of his best assists than anybody else scoring goals. He read the game like nobody else, saw things that other people didn't see. Amazing precision. He made Freddie Ljungberg look good with the assists he made for him. Obviously as a Swede we remembered those moments well. Tomas Rosicky, it has been for quite a while. He's had his ups and downs, but the last year has been great to see him play again, smile, score goals. He has speed, determination, and lots of energy. Very good to see him come back from injury and he is going to mix it well with Ozil and Cazorla in the fight for creative midfield spots. Henry's comeback goal versus Leeds. It was a fairytale story. I remember I was at my parents house, and I screamed so loud that my mum came out of the bedroom to see what all the commotion was about, I think she had thought I had won the lottery or something crazy like that. It was a typical Henry goal. The celebration afterwards, you could just tell from that alone that he was, and still is a true Gooner. 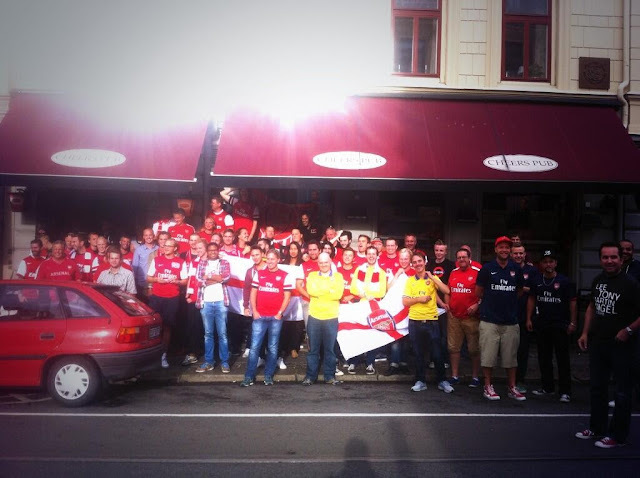 Q.Where do you watch Arsenal in Gothenburg? Cheers Pub. Great atmosphere, only our 2nd season there. The staff look after us, the walls are red and white, there's lots of TVs. It's also just the right size, so it keeps the atmosphere in. I think we will compete for the title but I don't think we will win it. I would say 3rd place finish. I think Chelsea will win. Mesut Ozil ! ! ! The expectations will be insane. I think he is in the top 5 players in the world alongside Messi, Ronaldo, Falcao and <ahem> Bale. He could be our new Bergkamp! So, with the final European 'Meet the Gooner Family' over and done with, it's time to bid farewell until next time. I will be flying to North America on Friday where I will kick back for a while before starting the next leg of the GOTR campaign on the 14th against Sunderland, where I will be at the Burgundy Lion in the city of poutine, smoked meat and questionable infrastructure, yes it's Montreal. In the meantime, please keep spreading the word and donating to the cause! Firstly, my apologies for this post being later than usual. It is now Wednesday, and we beat our North London Rivals on Sunday. When you consider that I was subject to the usual hospitality from the local Gooner contingent (in this case Arsenal Gothenburg), you might guess that I was in no fit state to talk, or even write up until today. I did manage to stay upright for long enough to see that we've signed some guy called Ozut Mezil, but that was by far the most active I have been up until now. Thankfully I'm feeling a lot better today so it gives me the chance to talk about a number of happenings on Sunday. Firstly though, I can't write about anything to do with beating Spurs or breaking our transfer record more than twice over, until I tell you that Arsenal Gothenburg, with help from the Cheers Pub in which they watch all their games, helped me to raise 6060 SEK, or £590, for my fundraiser. That's a massive contribution when you consider that the football season lasts 9 months and my goal is £10k. It gives me a lot of momentum, so for those that are reading in Gothenburg, thank you very much for the efforts. So, it was a good old one-nil to the Arsenal. Once again the good looking French guy proved he's got what it takes to challenge for the Golden Boot this season by firing one in past his International teammate. It was a goal that made fans around the world fist-pump in ecstasy, and of course Gothenburg was no exception. I believe the turnout was around 100 people (the video above doesn't do the place any justice as there were just as many Gooners in the room next door) and the atmosphere was, understandably because of the NLD, the best I had experienced so far on my tour. 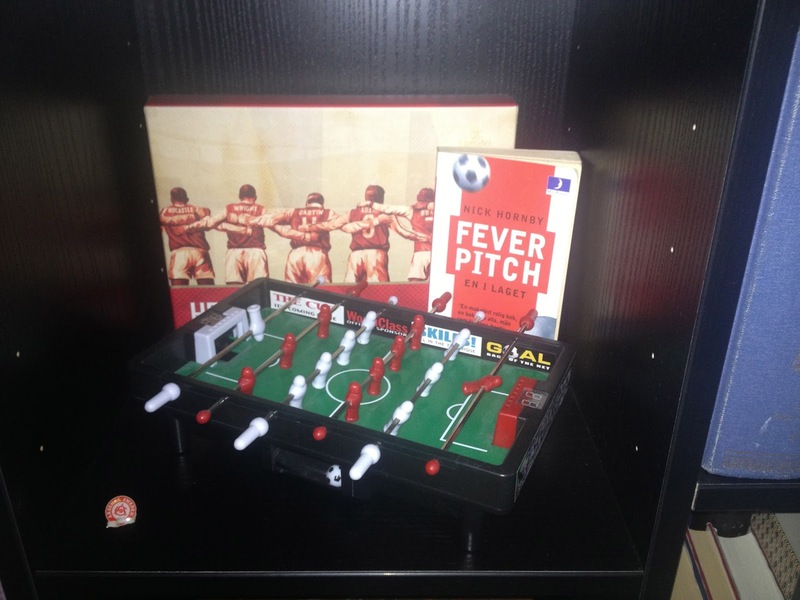 The staff at Cheers Pub were also on top form and I was literally drip-fed beer by the many fellow Gothenburg fans. It was an evening to remember, which for me, is more easily said than done! Anyway, later on the blog we will do the customary 'Meet the Gooner Family' feature, which this time round will focus on my Gothenburg host Jesper Larsson who is, alongside the Chair of Arsenal Gothenburg Reine Björk, a complete legend in helping me feel settled in and 'at home' in Gothenburg, and of course orchestrating a very, very successful fundraising event that gets the Gooner On The Road cause flying with some real momentum. Oh, and which team just signed Mesut Özil? That's right, The Arsenal did!